Amy was looking forward to her 25th anniversary with her husband, Tom. She hoped to make it a very special occasion. 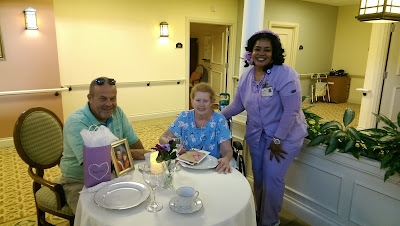 Geri, a personal care specialist at Joanne’s House, asked what we could do to help make it memorable for the happy couple. Our volunteer coordinator was able to find a tablecloth and fine china from our volunteer closet. 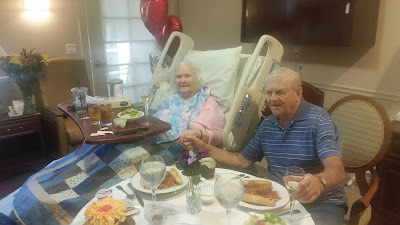 We provided their favorite dinner from Outback Steakhouse along with a celebratory cake. In the Hospice House kitchen, staff helped plate the dinner for a pretty presentation. Not to be outdone, Barbara and John celebrated a special anniversary of their own not long afterwards! These two loving couples made everyone smile, showing us that at Hope Hospice, every day can truly be a gift.